This is kind of mess, the unfortunate parts of it coming from the Washington Post. 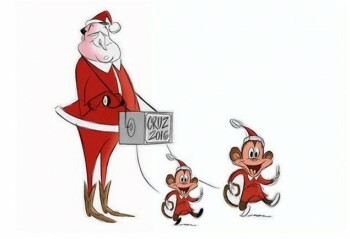 The esteemed, award-winning cartoonist Ann Telnaes made a cartoon about Ted Cruz using his children in a campaign by portraying the surging presidential candidate as an organ grinder and his kids as the organ grinder's monkeys. Cruz responded with the typical "leave my children alone" rhetoric that's been a part of every modern presidential campaign since at least 1992, and probably before that (I only remember Amy Carter becoming a thing after the election, with Garry Trudeau for instance depicting her off-panel). Conservative media ran with that message and criticism for the choice of depicting the girls as monkeys, as if the point of the cartoon were "Look at those monkey-children" rather than Cruz's cynical deployment of them as props. As the linked-to article notes, the Post then pulled the cartoon in a bizarre way: a statement asserting that the editor in charge failed to read a gigantic caption, a shift in blame to their cartoonist in that same statement for usurping some sort of house rule when the only house rule the Post has ever made public is "don't criticize the Post," and a decision not to address the matter any further which means slam dunks for all eternity on the monkeys point, which I'll note is the exact kind of visual element an editor -- maybe one that can read captions -- might have questioned for its potential diversionary capability or vetted for any harm inherent to the depiction, if it were to be questioned at all. This set of glorious, late-arriving actions certainly hasn't alleviated any criticism and the whole thing has become a fundraising opportunity for a Cruz campaign desperate to find a personal narrative that matches their candidate's skill with conservative rhetoric. So yeah, a mess. I hope that the sloppy, can-you-top-this handling of the cartoon post-publication doesn't do harm to Telnaes' career or boost Cruz'. I'm seeing a lot of headlines and articles stating the cartoon is about Cruz's kids rather than the candidate's use of them, so I'm guessing any reasonable distinction being made there is 100 miles in the rearview mirror at this point. It's a different world for editorial cartooning with campaigns leveraged by social media against not-really-trusted-by-anyone mainstream organizations. Everyone please be careful.